After dinner, we took Thomas out of the package to the delight of the boys. Mattias quickly grabbed the remote only to realize it needed batteries. Thomas came with batteries (4 AA) which was a nice surprise, but we needed 2 AAA batteries for the remote. Thankfully, we have a stockpile available for other toys! While I put the batteries in the remote, the boys were happy to press the gold “1” on the side of Thomas. The train would race around in a circle; go forwards and then flip over backwards. Both of my boys were then squealing with laughter. The remote was a big hit and really made the toy that much better. I don’t know what it is about remotes, but every child is happy to play with them! On the packaging, it states that the toy is for children ages three and up. 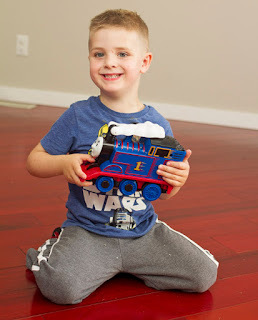 It was easy for both boys to operate Thomas by pressing the button on the side of the train. When it came to the remote, Mattias mastered the four simple buttons in a few minutes: Forward, Backwards (which makes Thomas not only go backwards, but backwards in a circle; Wheels up, and Flip over. Mattias soon realized that he could hold the buttons down for different effects. For my two-year old Markus, the buttons were easy to press but he would press too many, too fast then jump, dance and run all over the place. We discovered the train would not work when the remote was more than about 10 feet away or if obstacles obstructed the signal. After we slowed Markus down and encouraged him to hold just one button, he was able to work the remote just fine! Thomas even asked for help when he didn’t end up on his wheels. The one thing that I didn’t like was how clunky the toy is. We all know that childrens’ toys are loud. I get that. But the train’s back flips resulted in four clunky thuds on the wooden floor as he rolled over. I found that part much more annoying than the actual sounds the new Thomas toy makes. 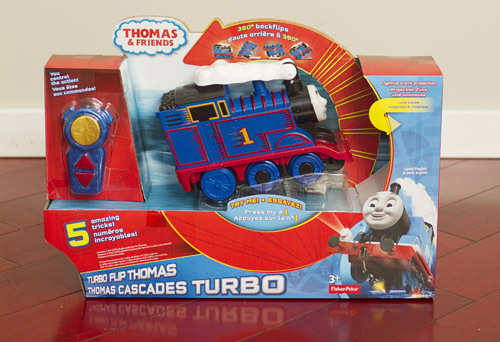 I would recommend this to any Thomas lovers out there and think it will suit a wide age range of kids! Mattias took it to CEFA with him the day after we got it and all of his classmates were excited to watch it and try it out! The remote definitely has a wow factor with older children like Mattias because they get some control over the moves, rather than just pressing the button on the train. 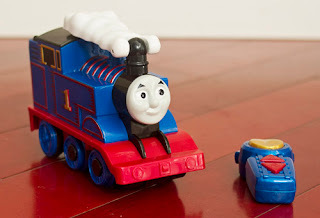 If for some reason the remote is misplaced (we all know how toy bins can be), children can still play with Thomas by pressing the button on the side.